This project is to create a digital timer that has quick setting time selection, countdown timer with alarm, elapsed timer and the ability to pause and restart timing. It uses an Arduino Uno, Adafruit 7-segment display and a rotary encoder to set the time. Miscellaneous components such as capacitors and resistors are also required and listed in the parts list below. You set the timer by turning the rotary encoder knob until the display shows the required time. The knob is then pressed to start the timer and it counts down in seconds. When the timer reaches zero it stops and sounds the alarm. If the encoder's knob is pressed briefly while it is counting down, the timer will stop; pressing it again will restart where it left off. If the encoder's knob is pressed with the display at 0:00 the elapsed timer will start and count up in seconds. To reset the timer, the encoder's knob must be pressed and held until the display resets to 0:00. The possible times that can be chosen are hard-coded in the program but can of course be changed. The intention is to emulate some microwave ovens by incrementing slowly at short times but increasing the interval as the overall time setting increases. As coded, the program permits the following times: 10s, 20s, 30s, 40s, 50s, 1m, 1m15s, 1m30s, 1m45s, 2m, 2m30s, 3m, 3m30s, 4m, 4m30s, 5m, 5m30s, 6m, 6m30s, 7m, 7m30s, 8m, 8m30s, 9m, 9m30s, 10m, 11m, 12m, 13m, 14m, 15m, 16m, 17m, 18m, 19m, 20m, 22m, 24m, 26m, 28m, 30m, 35m, 40m, 45m, 50m, 55m, 1h, 1h5m, 1h10m, 1h15m, 1h20m, 1h25m, 1h30m. If you extend the array of times, the program calculates the number of time values itself as part of its setup function. If you wanted to have all the increments in seconds, then the relevant parts of the program might benefit from being rewritten. The hardware components should be connected as shown in the diagram that will appear here shortly - I am just finalising it in Fritzing. None of the components need to connected with any specific polarity. The program can be downloaded from here. 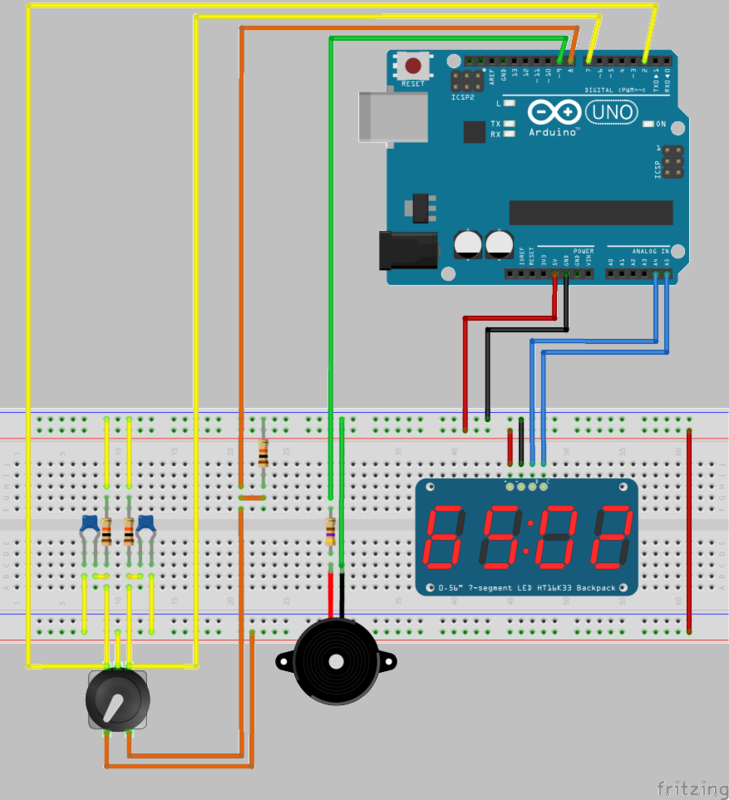 The timer uses I2C signalling to control the LCD display (4 wires) and three digital input pins, two for the rotary encoder and one for its SPST switch. The program uses the default I2C address of 0x70 for the LED display. The rotary encoder comprises two pairs of contacts that can be used to determine the direction of rotation. 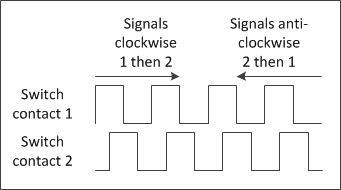 One pair of contacts feeds into a digital input pin that is set up as an interrupt, so that whenever a rising edge signal is received, a function is called that interrupts the program. The program then checks the value on the other encoder contact; if it is set HIGH then the direction is one way, if it is not set then it's set the other. The actual direction of rotation depends upon the encoder and how you've connected it so you may wish to swap connections if increasing time is found to be anti-clockwise. I bought the rotary encoder from Amazon and it was described as a "5 pin D shaft 20 detents 360 degree rotary encoder with push button". It cost about £2 with free delivery. When the alarm time decreases to 0:00, the alarm sounds. The alarm is reset by pressing the knob. The circuit as shown expects an 8Ω loudspeaker and has a resistor in series to limit the current. The loadspeaker is connected to PWM pin 9 that can be used to generate a square wave signal at a desired frequency. The program is written to generate two frequencies of different durations so that the alarm can be differentiated from other sounds.